The kiosk, "Periptero" in Greek, is an important part of Greeks everyday life for almost a century. 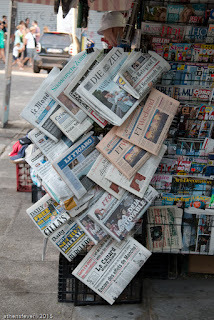 It is the equivalent of the newsstand that can be found in many countries around the world, with the difference that it is present in every major streets of all cities and villages in Greece. Besides newspapers, the 'Periptero' is the only place, with a few exceptions, where you can buy cigarettes. Other items one can find are: sweets, chewing gum, chocolates, cold drinks, beer, transportation tickets, ice cream, sanitary pads, soap and many more. 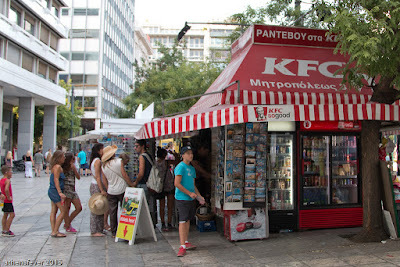 Kiosks tend to adapt to the needs of the neighborhood, indeed one may notice that kiosks on Syntagma Square target tourists. 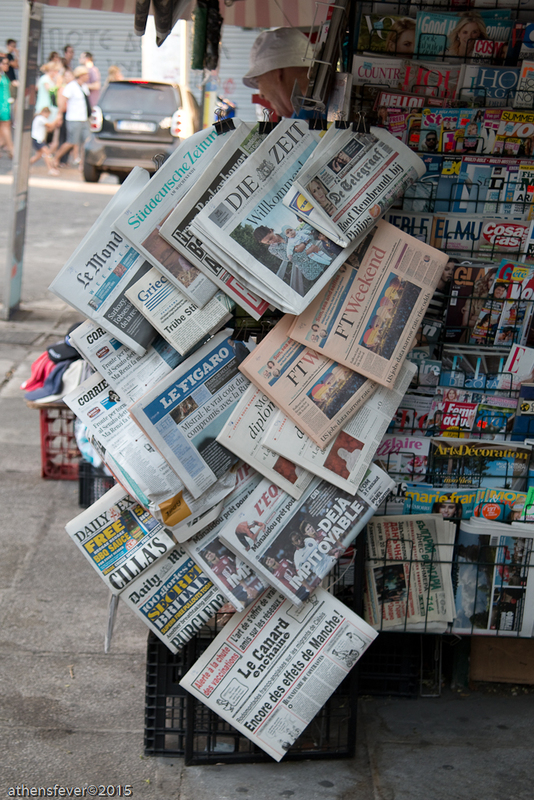 Foreign newspapers, souvenir items, sunglasses, and post cards are a few common items found there. In Kolonaki, the aristocratic area of Athens with top name boutiques, fashion magazines such as Vogue are common. There is even a 'periptero' on 26 Kanari street that sells cigars! Most of the kiosks are open 24 hours round. Periptero owners know very well their neighborhood, it's the best place to ask for directions if you get lost. Pain killers such as Asperine or Panadol are commonly sold. You can use fast mail delivery service at some Kioks. The service is known as 'Kiosk Express' provided by ACS Courrier. Only documents up to 200gr/7oz are accepted. Use ACS store locator to find the nearest Periptero. The kiosk has always change for Euro bills. 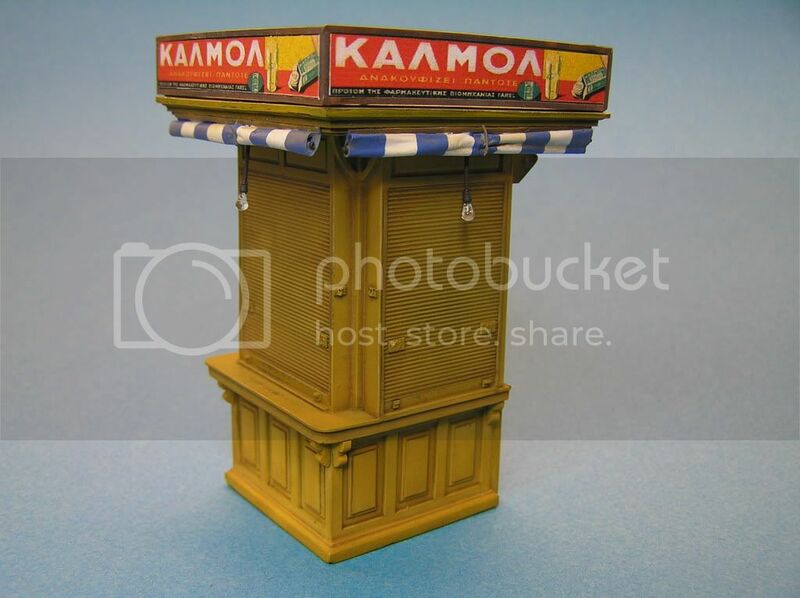 This is a reduced model of the Greek kiosk as it used to be found in the cities of Greece between the '30s till the '70s. It consists of 17 colored parts, the lamps and the publicity panels. You get acquire this model from the www.slingshotmodels.com modeling site.